VATICAN CITY (CNS) — Christian hope and faith in the afterlife mean the sting of losing a loved one does not have to leave behind a poisonous venom in our lives, Pope Francis said. “Our loved ones have not disappeared into dark nothingness: Hope assures us that that they are in God’s good and strong hands. Love is stronger than death,” he said at his general audience June 17. When a loved one dies, especially a child or a parent of young children, “death is never able to appear as something natural,” he said. It is “heart-rending” when a mother and father lose a child: “It’s as if time has stopped. An abyss opens that swallows up the past and the future,” he said. Losing a child seems to go against everything life is supposed to be about, he said. “It’s a slap in the face to all the promises, gifts, and sacrifices of love joyously given to the life we have given birth to,” he said. They ask, “Where is daddy? Where is mommy? '” or “‘When will mommy come back home?’ Oh, what do you say? 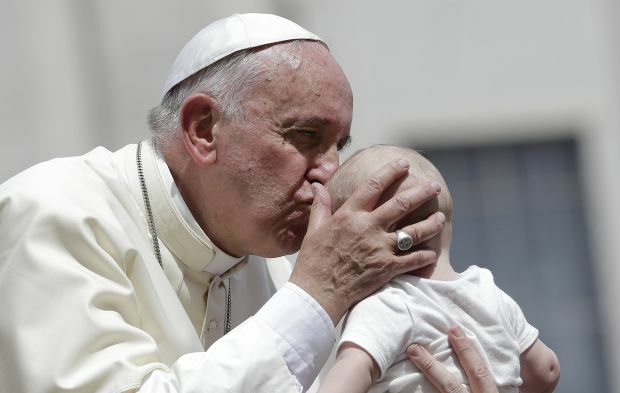 The child suffers” and he or she lacks the experience or understanding “to give a name to what has happened,” the pope said. Sometimes family members will blame God. “I understand. They get mad at God, they curse him,” or begin to question or doubt his existence, the pope said. “This anger is a bit of what comes from the heart of huge heartache” of losing a family member, he said. “May the Lord free us from getting used to this” kind of loss of life, he said. He asked that today’s priests and all Christians find ways to better express what the faith means when facing the death of a loved one. People need to mourn, “you must never deny people the right to cry,” he said. The Lord will reunite everyone once again, and it is this Christian hope and faith that will “protect us from a nihilistic view of death as well as false worldly consolation,” myths or superstition, he said. “I invite everyone to ask forgiveness for the people and institutions that close the doors to these people who are seeking a family, who want to be cared for,” he said to applause.